Volcanic ash consists of tiny jagged particles of rock and natural glass blasted into the air by a volcano. Ash can threaten the health of people and livestock, pose a hazard to flying jet aircraft, damage electronics and machinery, and interrupt power generation and telecommunications. Wind can carry ash thousands of miles, affecting far greater areas and many more people than other volcano hazards. Even after a series of ash-producing eruptions has ended, wind and human activity can stir up fallen ash for months or years, presenting a long-term health and economic hazard. 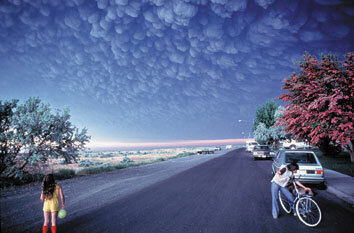 On the morning of May 18, 1980, many people in eastern Washington noticed dark, threatening clouds approaching from the west. Most thought the clouds were part of one of the enormous thunderstorms common in late spring. However, what they did not know was that at 8:32 a.m. Mount St. Helens had erupted explosively, blasting an enormous column of volcanic ash and gas more than 60,000 feet into the air. As the clouds drifted overhead, a rain of ash began to fall, plunging much of the region into darkness that lasted all day. 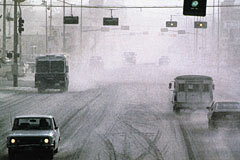 Homes, farms, and roads were quickly covered by as much as 4 inches of gritty ash. The smallest ash particles penetrated machinery and all but the most tightly sealed structures. By the end of the day, more than 500 million tons of ash had fallen onto parts of Washington, Idaho, and Montana. The ash prevented travel throughout much of eastern Washington because of poor visibility, slippery roads, and ash-damaged vehicles, stranding more than 10,000 people and isolating many small communities. More than $1 billion in property and economic losses was caused by Mount St. Helens' 1980 eruptionmuch of it by ash. 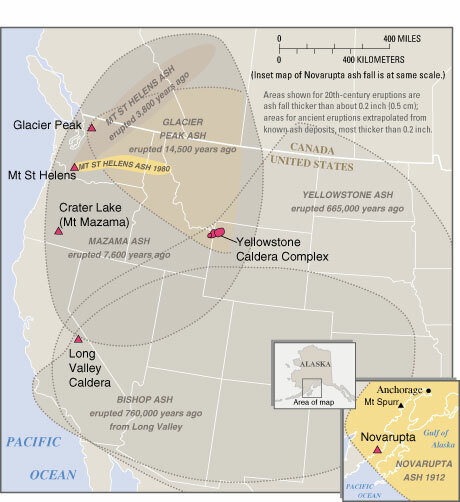 Future large explosive eruptions in the United States are certain to produce widespread ash falls and are likely to cause even greater losses. 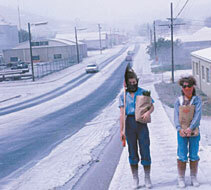 Since 1980, rapid population and economic growth in the Western United States, widespread use of computers and electronics, and the dramatic increase in jet-airline traffic, especially over the North Pacific, have made more people and property in the Nation vulnerable to the effects of volcanic ash. Knowing the characteristics of volcanic ash and being prepared when a volcano shows signs of restlessness can significantly reduce the potential economic and health impacts of airborne and falling ash. Volcanic ash, like this 1980 ash from Mount St. Helens, Washington, is made up of tiny jagged particles of rock and glass (photo on right; magnified 200 times). Long and severe exposure to such ash particles, without protective breathing equipment, can be dangerous and harmful. For people with heart and lung ailments, inhaling ash can cause serious respiratory problems. Small jagged pieces of rocks, minerals, and volcanic glass the size of sand and silt (less than 1/12 inch or 2 millimeters in diameter) erupted by a volcano are called volcanic ash. Very small ash particles can be less than 1/25,000th of an inch (0.001 millimeter) across. Though called "ash," volcanic ash is not the product of combustion, like the soft fluffy material created by burning wood, leaves, or paper. Volcanic ash is hard, does not dissolve in water, is extremely abrasive and mildly corrosive, and conducts electricity when wet. Once in the air, hot ash and gas rise quickly to form a towering eruption column, often more than 30,000 feet high. Larger rock fragments more than 2 inches across ejected by the explosion typically fall within a few miles of the eruption site. However, wind can quickly blow fine ash away from the volcano to form an eruption cloud. As the cloud drifts downwind from the erupting volcano, the ash that falls from the cloud typically becomes smaller in size and forms a thinner layer. Ash clouds can travel thousands of miles, and some even circle the Earth. Ash from Mount St. HelensYakima, Wash., May 1980. Ash from Spurr VolcanoAnchorage, Alaska, August 1992). Copyright Anchorage Daily News. Ash from Mount St. HelensEphrata, Washington, May 1980. Copyright Douglas Miller. Ash fall from the two largest eruptions in the United States in the 20th century (yellow) is Ash from Mount St. Helens' Ephrata, Wash., May 1980 ((c) dwarfed by ash fall from ancient eruptions. More than $1 billion in losses was caused by Mount St. Helens'1980 eruptionmuch of by ash. Ash falls from future eruptions are certain to be widespread and hazardous. To reduce health risks, people should avoid breathing ash, wear dust masks and goggles, not use contact lenses, and stay indoors when possible. 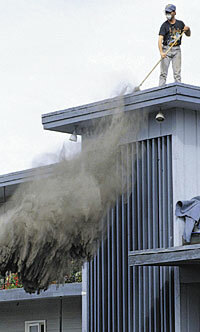 When volcanic ash accumulates on buildings, its weight can cause roofs to collapse, killing and injuring people. A dry layer of ash 4 inches thick weighs 120 to 200 pounds per square yard, and wet ash can weigh twice as much. The load of ash that different roofs can withstand before collapsing varies greatlyflat roofs are more likely to collapse than steeply pitched ones. Because wet ash conducts electricity, it can cause short circuits and failure of electronic components, especially high-voltage circuits and transformers. Power outages are common in ash-fall areas, making backup power systems important for critical facilities, such as hospitals. Eruption clouds and ash fall commonly interrupt or prevent telephone and radio communications in several ways, including physical damage to equipment, frequent lightning (electrical discharges), and either scattering or absorption of radio signals by the heated and electrically charged ash particles. Volcanic ash can cause internal-combustion engines to stall by clogging air filters and also damage the moving parts of vehicles and machinery, including bearings and gears. Engines of jet aircraft have suddenly failed after flying through clouds of even thinly dispersed ash. Roads, highways, and airport runways can be made treacherous or impassable because ash is slippery and may reduce visibility to near zero. Cars driving faster than 5 miles per hour on ash-covered roads stir up thick clouds of ash, reducing visibility and causing accidents. Ash also clogs filters used in air-ventilation systems to the point that airflow often stops completely, causing equipment to overheat. Such filters may even collapse from the added weight of ash, allowing ash to invade buildings and damage computers and other equipment cooled by circulating outside air. Agriculture can also be affected by volcanic ash fall. Crop damage can range from negligible to severe, depending on the thickness of ash, type and maturity of plants, and timing of subsequent rainfall. For farm animals, especially grazing livestock, ash fall can lead to health effects, including dehydration, starvation, and poisoning. Like airborne particles from duststorms, forest fires, and air pollution, volcanic ash poses a health risk, especially to children, the elderly, and people with cardiac or respiratory conditions, such as asthma, chronic bronchitis, and emphysema. The best time for communities, businesses, and homeowners to make preparations for a rain of volcanic ash is before an eruption occurs. When an explosive eruption does occur, warning of advancing ash clouds may precede actual ash fall by only minutes or hours. By developing community emergency-response plans that can be activated when a volcano is threatening to erupt, the harmful and disruptive effects of ash can be greatly reduced. So that the public can be warned of impending eruptions and advancing ash clouds, the U.S. Geological Survey (USGS) and cooperating organizations operate instrument networks that monitor more than 40 active volcanoes in the United States.